Roses are some of the most cherished flowers. They are universally loved for the delicacy of their velvety petals, the exquisite beauty of the unfurling bud, the strength and brilliance of their colorful blooms, their heavenly fragrance, and their pure, unrivaled elegance. Growing Requirements And Planting Suggestions: All Roses require a well-drained, medium loam, slightly acidic soil. Mix organic matter, such as peat moss and compost, approximately 12″ deep to improve soil’s drainage and aeration. The location site should have full sun exposure and plenty of air circulation. Plant early spring or late fall. Dig a hole several inches wider and deeper than the pot. Adjust so the bud union is just above the ground. Don’t plant any deeper than the original pot. Water the hole well before and after planting to settle the soil. Mulch the rose bed to retain moisture. Watering Roses should receive the equivalent of 1″ of rain a week from the spring throughout the fall. In early spring water from overhead to prevent the canes from drying out. After foliage appears, apply water directly to the soil. Keeping water off the leaves helps to prevent leaf fungus. Fertilize often during the growing season (May-August) until six weeks before frost. You may select either a granular or liquid fertilizer. Please apply fertilizer according to the manufacturer’s directions. Liquid fertilizers will need to be applied more often than granular fertilizers. Deadhead faded blossoms for better performance. Clean all debris like damaged leaves and spent blossoms to help prevent diseases. Apply Fungicide and insecticide to prevent and control Black Spot, Powdery Mildew and Aphids. Susceptibility to disease differs from variety to variety. Preventative spaying with Ortheane Rose Pride or Fungonil Fungicide in MN is recommended because of the humid summers. Always spray in the evening when cooler to prevent sunburn. All types need winter protection except shrub roses. 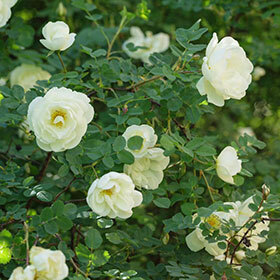 Prune roses to 10-12″ from the ground except for Climbing and Shrub Roses. Use dry leaves or mulch to mound around the base of the rose. Make sure all the material that you use is dry. Cover with a rose cone. Cones must be weighted down to keep them in place during strong winds. For climbing roses mulch the base. Roses Trees can be tipped for over wintering. Dig a trench by the side of the rose, tip it over and then cover it with soil and mulch.